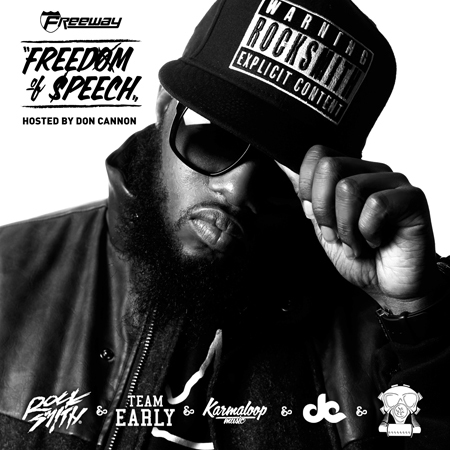 Freeway, he of the tremendous beard , has released his new mixtape Freedom Of Speech. The 16-track tape is hosted by DJ and producer Don Cannon. Freedom Of Speech features guest appearances from fellow State Property member Young Chris, as well as Atlanta female rapper Diamond. Meanwhile Philadelphia legends Jakk Frost and Malik B, formerly of The Roots, join him on Beards R’ Us. Production comes from Jake One and Cardiak. For the mixtape Freeway partnered with streetwear line Rocksmith Tokyo and fashion retailer and culture outlet Karmaloop, who also partnered with him to shoot a number of videos for the mixtape. The former Roc-A-Fella and Rhymesayers rapper has recently whet appetites with the track Jungle, from his forthcoming album Diamond In The Ruff, dropping November 27th.